This past St Patrick’s Day students from a number of local job training programs, including Jubilee Home’s Youth Build Program and Matawon Development Group from the South Side, attended a day long workshop about green infrastructure, green jobs and green funding. Group from Jubilee Homes Youth Build. 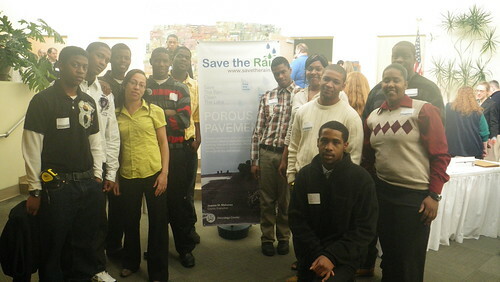 The workshop, which was hosted by the Onondaga Environmental Institute and the Partnership for Onondaga Creek, drew 180 participants including local engineers, landscape architects, contractors and municipal officials seeking to learn more about porous pavement and the green construction projects that are currently underway around Syracuse in conjunction with Onondaga County’s “Save the Rain” program. County Executive Joanie Mahoney has announced Onondaga County will implement 50 green infrastructure projects (including porous pavement, green roofs, urban trees, and rain gardens) in 2011, with more projects planned for next year. As a result, Syracuse will be one of the “greenest” cities in the country by 2018. Numerous porous pavement projects have already been completed throughout Syracuse, allowing water to soak into the ground, rather than flowing as stormwater into the sewer system. Soaking up rainwater and snowmelt onsite helps prevent situations where stormwater overwhelms the capacity of the sewer system, causing both rainwater and sewage to overflow into local waterways. Among the workshop’s featured presentations were guest speakers from the University of New Hampshire Stormwater Center that specialize in studying how porous pavements allow rainwater and snowmelt to soak into the pavement in cold climates. Several technical presentations were given, including how porous pavements can be designed, installed, and maintained to function properly and absorb rain and snowmelt despite Syracuse’s notorious winters. Other presentations highlighted the County’s “Save the Rain” program, which encourages residents to help capture stormwater at home by installing rain barrels, rain gardens, green roofs, and porous parking lots/driveways. The Green Improvement Fund (GIF) was the focus of another presentation. The GIF fund is a funding opportunity for nonprofits and businesses (located in particular City neighborhoods) seeking assistance to install green infrastructure on their properties. The fund will assist local business, churches, community centers and other groups by providing county funds to upgrade a conventional project to a “green” project. For example, a business or nonprofit looking to re-do a parking lot could receive reimbursement for the extra expense incurred by using porous pavement instead of the traditional concrete or asphalt. Of particular interest was a panel of local training program representatives (including CNY Works, SUNY-ESF, L & M Training Center, ACTU Association, and the Onondaga Earth Corps) who spoke about the potential for connecting local workers, minorities, skilled youth and green training graduates with green infrastructure jobs. Theardis Martino, Director of the Matawon Development Group/L & M Training Center, spoke about the importance of integrating local job seekers graduating from community training programs such as Matawon with green construction projects and employers. Workshop participants also discussed how minority and women-owned businesses could be better involved in jobs created by the County’s green infrastructure program. Workshop attendants wrapped up the day with a tour of the green infrastructure in use at the zoo, including porous pavement in the courtyard, the rain barrel collection system, a rain garden around the outdoor primate exhibit, and a planned green roof on the new elephant building.